Online retailer Amazon has patented a wristband that can monitor the hand movements of its warehouse employees and direct them to items using small vibrations. 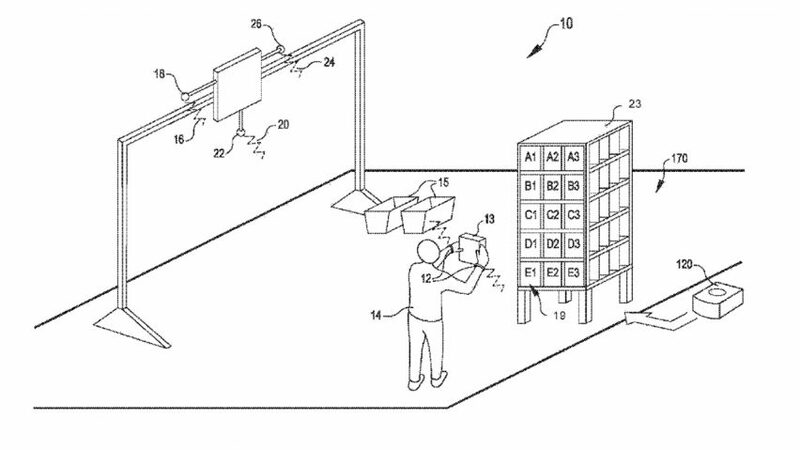 The patents, which were filed in 2016, outline Amazon's vision for an inventory management system that uses wristbands to track workers' performance and help them locate products in vast warehouses. Called the Wristband Haptic Feedback System, the series of patents shows a system where employees are guided to "item bins" by tracking hand movements in real time using ultrasound technology. Messages are then relayed to the employee using small vibrations emitted from the wristband's bracket. If their hand moves away from a product, a vibration lets them know they are going in the wrong direction. "Ultrasonic tracking of a worker's hands may be used to monitor performance of assigned tasks," reads one of the documents. "The ultrasonic unit is configured to be worn by a user in proximity to the user's hand and to periodically emit ultrasonic sound pulses." "The management module monitors performance of an assigned task based on the identified inventory bin," it continues. Amazon believes this method could provide a solution to the time-consuming act of locating items in warehouses. "Existing approaches for keeping track of where inventory items are stored may require the inventory system worker to perform time-consuming acts, such as pushing a button associated with the inventory bin or scanning a barcode associated with the inventory bin," said Amazon in a statement to The Verge. "Accordingly, improved approaches for keeping track of where an inventory item is stored are of interest." Although the system may raise problems concerning workplace surveillance and labour conditions, Amazon maintained that time-saving and convenience were the reasons for filing the patents. "The speculation about this patent is misguided," said the retailer. "Every day at companies around the world, employees use handheld scanners to check inventory and fulfil orders." "This idea, if implemented in the future, would improve the process for our fulfilment associates," it continued. "By moving equipment to associates' wrists, we could free up their hands from scanners and their eyes from computer screens." The proposal for the Wristband Haptic Feedback System is the latest in the line of futuristic Amazon patents. Last year, the company moved to patent a series of underwater warehouses, while in 2016, it filed documents for warehouses carried by airships. Also, this year saw the launch of Amazon Go – an app-enabled store that allows shoppers to simply walk out with their groceries.